Wow, this week got away from me! I almost forgot to play along with Muse! GASP! This time of year is crazy if you've got kids - all the end-of-the-year recitals (and extra rehearsals that go along with those) and celebrations make it super busy, but fun! I used Papertrey's Outline Alphabet, coloured with copics and stickles, and part of a Paper Smooches sentiment. Tomorrow morning at 8 am EDT is the deadline - I hope you'll play along, but even if you can't, you can pop over and vote for your favourites between 8 am Monday and 8 am Tuesday. Results will be posted on Tuesday at noon. Oh I love the gradient color in the alphabet letters. Fabulous Ardyth. I love the gradient in colors :) unique and CAS ! 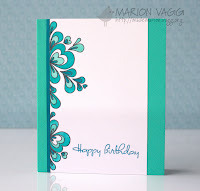 I love how you were inspired by Marion's card! The sparkled up shades of blue are so pretty! You sound sooooo busy! But, the relaxing days of summer are right around the corner! This is great! Love how you colored the letters and added the sparkle!